Big food companies are always trying to convince us that their products come from idyllic family run farms, although that rosy image couldn't be further from the truth. 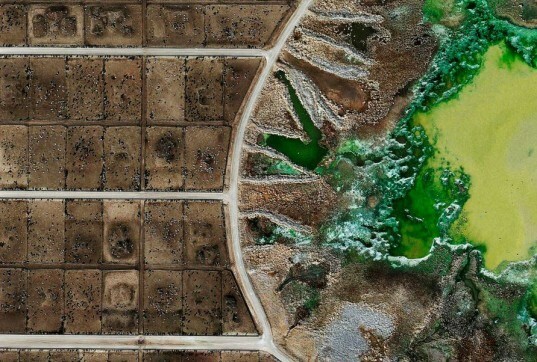 A recently released batch of aerial photographs by British artist Mishka Henner show that factory farming is taking its toll on our planet. In addition to producing nutrient-poor "food" rife with GMOs, these farms are literally carving swaths of death through the American landscape. Henner's shocking photos provide bird's eye proof of the destruction that follows when industrial beef farming moves into town. The images, discovered by Henner while researching satellite photographs of oil fields, look more like post-apocalyptic wastelands than acreage in America’s heartland. 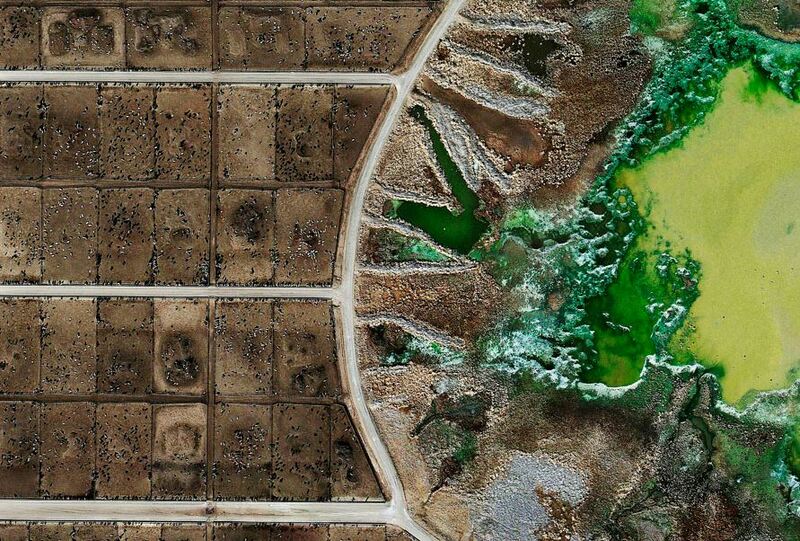 The aerial shots of factory farming feedlots are open source satellite imagery, so Henner doesn’t have to worry about the legal risk of publishing them. In recent years, the commercial agriculture industry has sought to hide its disgraceful practices from the public’s view, and journalists found photographing feedlots have faced arrest and criminal charges under bogus “Ag Gag” laws. It’s not hard to see why they’d rather no one know what they’re up to. “Massive waste lagoons, which waft up dangerous hydrogen sulfide fumes and can contaminate groundwater with nitrates and antibiotics, first resemble open, infected wounds,” explains Fast Co. The land on which the feedlots sit is totally barren, brown and dry. Brightly colored waste from the poor animals housed there gives off an alien glow against the neutral backdrop of dying land. The cows themselves look like ants from the aerial perspective, crowded together with no shade or comfort from the harsh conditions. I'm mortified seeing this - what is it going to take for people to realise that what they are doing is wrong on so many levels - when are people going to wake up to the fact that this is not just in the USA - there is a global shift towards veganism - more and more people are adopting a vegan lifestyle - if you carry on like you are - all you doing is orchestrating your own destruction - that it! America is slowly self destructing!!! and you want to take half the planet with you too! Might I suggest that when you post an article like this, (which is profoundly impactful) that it is configured to share the title and main image? The current share view (when it actually populates on Facebook) does not have any impact and does not entice readers to actually click on it. This is one of the main reasons we should all move towards a vegetarian diet. we poison animals then eat them, the waste and the in-humanity will poison our planet beyond repair.IT\'S NOT TO LATE, wake up people. Yes, Dave Enright. God, someone, something--SAVE US FROM OURSELVES!!! It is a crying shame that living beings are treated only as a product for us to use and abuse at will. Nikomeshi, thank you for your comments but do you really believe that we would have to grow more crops to feed humans if the human species did not eat meat? Do you know how much GMO grains and soy that the US produces to feed it\\\'s cattle? How much water is used to grow that produce as well as the waist water and contaminated water due to cattle raising. How much fuel is used in cattle production and transportation and humans would not need to keep cutting great swaths of forest in Brazil and Indonesia to raise cattle if we all ate the beens and grain that are fed to the beasts. Not that I would eat the GMO produce in the first place. America (including Canada) is an irreversible glutinous land of greed that is destroying all that was innocent, healthy and natural. "God save our land." I agree that animals should not be treated as they are. We don't need to have them smashed into tiny cages and ground into "meat". But I don't think going all vegan is the answer either. What is needed has been said for hundreds of years: moderation. People in the U.S do not need to eat as much as they do for starters. A little meat and a little vegetation can go a long way in the lifestyles we now live. For those encouraging eating only plants, where do you plan to grow all these plants to feed the world? There are 7 billion people on this earth. Do you realize how much space it takes to grow crops? We live in first world countries in which we can meander to the grocery store and buy vegetation to our hearts content. What about people who do not have that access? It's easy to tell people to sustain themselves when some people live on a quarter acre of land in a moderate climate, having access to clean water, the money to go buy chickens and materials to make a coop, and grow your own garden. But millions of people do not have these luxuries. Think about what you have and what others do not. Humans have eaten meat since they first evolved into the human species. Moderate instead of eliminate. We have NO need for cattle at all. Or pigs or chickens for that matter. But certainly no need for cattle, beef or dairy. Go vegan and live longer and better. to k9gardner: just so you are aware: yes, i became a vegetarian 3 years ago for precisely this reason. i am fairly certain that i am not alone! I think that all photo documentation of factory farming is very important. And yes I think that they can and will discourage people from eating factory farmed meat. A couple of images were enough to change my eating and shopping habits completely--my whole family is now engaged, as a direct consequence of some strong images. These are solid evidence that factory farming may truly be a far worse contributor to planetary warming than cars! Hmmm, and yet, is anyone going to stop eating meat as a result? Or only eat meat from animals raised humanely? I didn't think so. USA food is horrible- I hope the future men and women can help-as we did not know before my generation built the machines you now can grow to help your people- and USA- will we get well? A 10% tax on COMMERCIAL ANIMAL FEED will help we can take the manure and transport it to the Midwest growing areas. Also states need state laws that make that practice illegal. We need AIR PUMPS in the dead zones of rivers, bays and Gulf of Mexico NOW! don't buy industrial food and this should away. Organic and grow your own is the way to go when possible. The world needs to go vegan if we are to survive as a species. No more trash food..0r sick animals..SHUT THESE FARMS DOWN. PLEASE PLEASE HELP THEM :( HOW IS THIS ALLOWED TO HAPPEN ? ? ? ? ? I have always hated feedlots, the smell can gag.. The worst in the country is a 10 mile stretch in Bovine Tx.. Thanks for this article, it totally confirms what I always wondered. Thank you, Beth Buczynski; for being one of the increasingly few contributors to Inhabitat that actually share anything here that is not only substantial and legitimate, but significant and relevant in nature. If it wasn\\\'t for you a small other handful, the only reason to follow Inhabitat would be to stand by and point out all the glaring inconsistencies,ludicrous distractions and downright falsehoods other contributors try to pass off as anything worth publishing. YOUR GREED IN THIS LIFE WILL COST YOU IN THE EVERLASTING ONE! I became a vegetarian, not for nutritional reasons, but for reasons of conscience. This is one of the reasons. Somehow there must be a means by which to balance the treatment of "meat animals" and the incessant quest for financial profits. I think that what that is is algae blooms in the containment lagoons of those feedlots. It looks gross, but the other way to look at it is that the pollution is concentrated in a controlled location and not allowed to run into the local water supply. The water is either allowed to evaporate or is pumped out to use as irrigation on nearby fields. The solids are left on the bottom of the lagoon and cleaned out occasionally and used as fertilizer. "We have factory farming in England, but we don’t have it on that scale. I was just absolutely blown away". you know why you dont have that in england? because england buys their meat from developing countries, like brasil and india. so, in order for the english people to eat meat, our brazilian forests are being killed to give more room to factory farming. it's just too wrong, we MUST become vegetarians for the sake of our planet!!! I lived near a small feedlot operation in Miles, Iowa (east central Iowa). The steers were fed in outside lots all year round. Obviously the owners of the feedlot didn\\\'t care that it was 90 degrees, and the steers were baking in the sun, or 20 below, and the steers were in the feedlot without shelter from snow and wind. In the summer the poor animals would have sections of skin without hair because of infestations of scabies or from other insects and disease. Since living near that feedlot in Iowa, plus having visited the largest family owned sow farrowing unit in the US and seen their abuse of the sows, I have only rarely eaten meat, and always under protest. Maybe, some decade, some century, we will learn to treat all animals humanely. For people in the UK GM is band I wrote to a report Bio ethics and what was and is really rare the Government fully accepted the report from Nuffield Council Bro Ethic and GM food is band in the UK. The images, discovered by Henner while researching satellite photographs of oil fields, look more like post-apocalyptic wastelands than acreage in America's heartland. 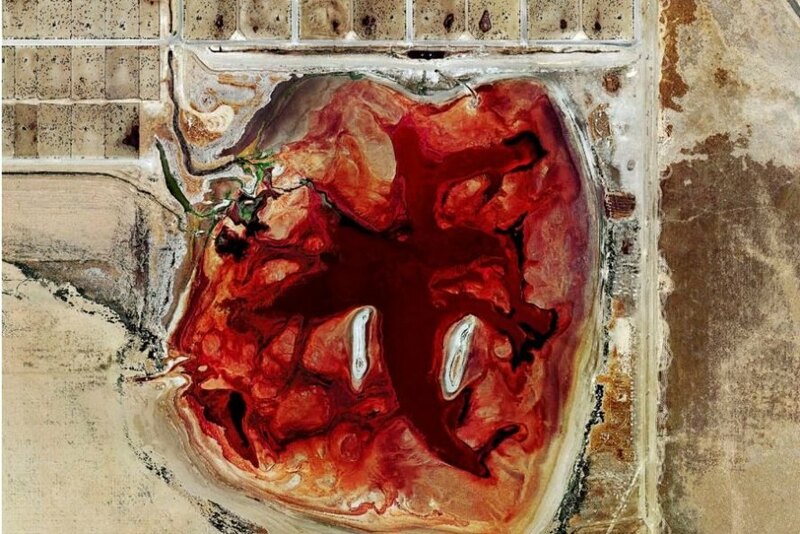 The aerial shots of factory farming feedlots are open source satellite imagery, so Henner doesn't have to worry about the legal risk of publishing them. In recent years, the commercial agriculture industry has sought to hide its disgraceful practices from the public's view, and journalists found photographing feedlots have faced arrest and criminal charges under bogus "Ag Gag" laws. It's not hard to see why they'd rather no one know what they're up to. "Massive waste lagoons, which waft up dangerous hydrogen sulfide fumes and can contaminate groundwater with nitrates and antibiotics, first resemble open, infected wounds," explains Fast Co. The land on which the feedlots sit is totally barren, brown and dry. Brightly colored waste from the poor animals housed there gives off an alien glow against the neutral backdrop of dying land. The cows themselves look like ants from the aerial perspective, crowded together with no shade or comfort from the harsh conditions. “To me, as somebody in the U.K., looking at something [like] the feedlots I was shocked on a very personal level,” Henner told Fast Co. “I think what the feedlots represent is a certain logic about how culture and society have evolved. On one level it’s absolutely terrifying, that this is what we’ve become. They’re not just feedlots. They’re how we are." An oilfield in Hockley County, Texas.